Product information "Lipase Activity Assay Kit"
Lipases perform essential roles in the digestion, transportation, and processing of dietary lipids by controlling the clearance of triglyceride-rich lipoproteins from the circulation. Manipulating lipolysis has therapeutic potential in the metabolic disorders frequently associated with obesity. Cayman's Lipase Activity Assay provides a fluorescence-based method for detecting lipase activity in plasma, serum, tissue homogenates, and cell culture samples. In the assay, lipase hydrolyzes arachidonoyl-1-thioglycerol to arachidonic acid and thioglycerol. 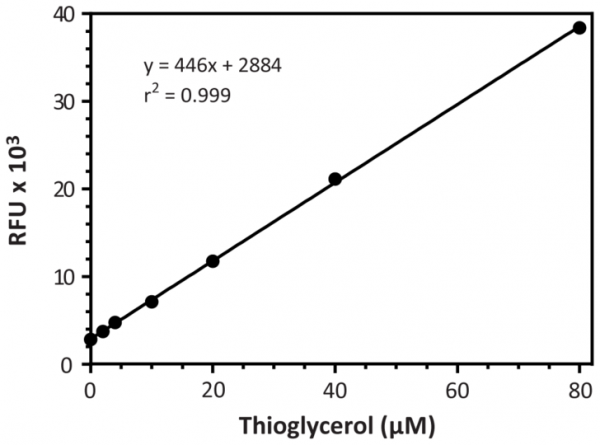 Thioglycerol reacts with the thiol fluorometric detector to yield a highly fluorescent product which can be analyzed with an excitation wavelength of 380-390 nm and an emission wavelength of 510-520 nm. Customer review for "Lipase Activity Assay Kit"